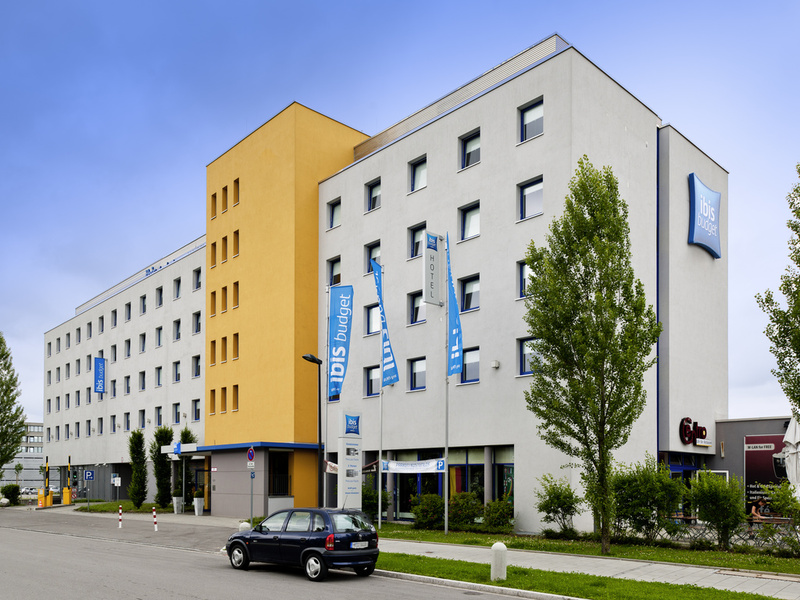 Hotel ibis budget Munich East Messe. Book now! Free Wifi! Was slightly surprised to see the level of building work going on next door. Would have liked a little warning of the 7am start time of the building noise. However this didn't distract from a usual Ibis experience. Small room but ok. Booked via Le Club Accor. Where are my points? Short and efficient. Clean & good shower. Very clean hotel, dog friendly, very nice staff (recepcionists, clean-workers). Complimentary coffee and drinks offered every day. Hotel has good connection with the city center (in 25 minutes by public transport). due to an ongoing renovation some minor comfort losses these days. The experience was variable. Due to the check in machine not working properly. No body on telephone reception after 10pm. Distance and travel by train from the airport further than expected... Breakfast cereals all included nuts.. Had better experience at Ibis budget in France than Munich. Check-in and check-out was pleasant and easy. Room was clean and was facing away from the street, which was very nice. Breakfast was better than expected for a budget hotel with complimentary breakfast. Towels in the room were a little small but manageable. Location is convenient in relation to Messe München. Overall a good experience. Easy to walk to fair ground but unfortunately According is overcharging badly. The guests that were staying in the hotel before me were smoking in the room. The smell was annoying. Arriving at 1 o'clock in the morning we could consider ourselves lucky to be able to get in. The 'check-in' machine was not working properly. I pressed the bell on the wall for help. The lady who answered basically disconnected herself after she heard me talking in English. She just declared : ' no English'. After this she did not answer at all. Since I was there with a very tired child I was rather concerned. I will be charged for staying there, even though I will not be able to sleep there. After a few minutes a dodgy looking man appeared, who also wanted to check in. He also did not succeed until another man appeared who came from the hotel. He told us that the machine has a problem and it is rather difficult to check in. the first man finally managed to put in his details. After this he offered to help me. It was rather suspicious and I did not feel safe at all.There was nobody from the hotel to turn to and this place was in the middle of nowhere. Anyways, he did something and I put my credit card it and payed 41 euro . After this we went up to sleep, since we were exhausted travelling 600 km. Since I did not feel secure there, I left very early in the morning, before breakfast. I have just checked my credit card today and have seen that after all this, I have also been charged twice for my one night stay. Once 41 euro, then 48. 50 euro ( see below:) 23/12/18 + 41.00 EUR IBIS BUDGET MESSE,MUENCHEN,GERMANY 22/12/18 + 48.50 EUR IBIS BUDGET MESSE,MUENCHEN,GERMANY I would like to get my 48.50 euro back and I would also like an explanation for why I have been charged twice. I am a regular customer at Ibis and this was the first time when I had such a bad experience. It felt as if though it was fine for me to pay (twice) for my stay, but in return I was left alone to struggle and fend for myself however I can in the middle of the night. I would really appreciate an answer and a refund asap. Thank you for taking the time to read my e-mail. Looking forward to hearing from you. Kind regards, Andrea B.
very pleasant stay with my family. if in muenchen for business I will stay again. good value for money, pleasant and helpful staff, good breakfast. Thanks. The staff were helpful and nice. The room was simple but clean and comfortable, thank you. The breakfast was simple and nice. All in all, very good. It would have been nice to be able to have a refund on one of the nights stay that I didn't need and the breakfast I'd paid for but was told that wasn't possible. However, there was demand for the room with someone asking to stay but they were told the hotel was fully booked. So, some flexibility to refund mine and allow them to stay would have come across as more helpful.